Home Commodities Has Zimbabwe removed a tyrant but not a tyranny? As we continue the debate about what is likely to happen next in Zimbabwe, Nicole Beardsworth explains the many continuities between the Mugabe and Mnangagwa eras, and assesses the limited prospects for change. As the upper echelons of Zimbabwe’s ruling party shift following President Robert Mugabe’s ouster, what can we expect from the ‘new’ regime in Harare? 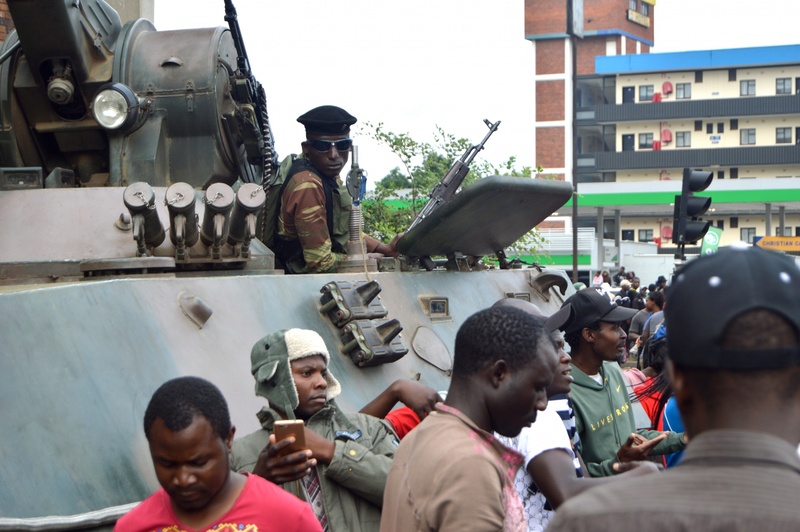 When on 14 November, army personnel carriers rolled into Harare, social media was ablaze with speculation. At 4 am on the 15th, the military appeared on the public broadcaster to announce that they had ‘secured’ the first family and were working to arrest criminals around the president. Military officials stated repeatedly and emphatically that this was not a coup, and that the constitution had not been abrogated. On 21 November, after a week of negotiations, Mugabe’s removal from the head of the ruling party and the instituting of impeachment proceedings against him, he resigned – ending his 37-year tenure. Vice President Phelekezela Mphoko became possibly the shortest-serving acting president in African history upon Mugabe’s resignation, but his whereabouts remain unknown. Emmerson Mnangagwa was then chosen by ZANU-PF to be the new president of Zimbabwe, just twenty minutes later. Mnangagwa was inaugurated on 24 November as Zimbabwe’s third president. It appears that the military had been planning their move for some time and had consulted with regional and international allies – although many, including China, deny this – to ensure that any intervention to remove the long-standing head of state would have international buy-in. But to carry it off, they had been warned that it needed to appear as legitimate and bloodless as possible. 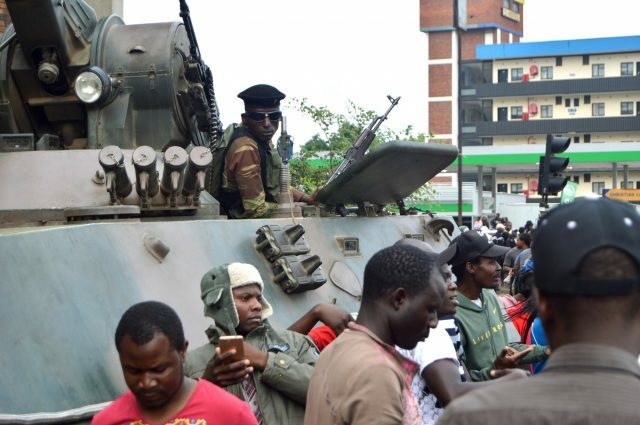 The military’s move had been planned for just before the December ZANU-PF congress where it was expected that Vice President Emmerson Mnangagwa would be removed; but it was moved up when Mnangagwa was unceremoniously removed on 6 November and Army General Constantine Chiwenga (Mnangagwa’s closest ally) received reports that he was to be arrested upon arrival in Harare from a trip to China. Mugabe’s removal was extremely popular – prompting thousands of Zimbabweans to march and celebrate in the country’s largest cities, and in cities around the world. Despite the popular celebrations, most analysts remain sceptical and believe that his removal has allowed the ruling party which backed him and sustained his regime for four decades to ‘renew’ itself. The title of this article was taken from a quote by Bulawayo MDC Senator, David Coltart on the day of the president’s ouster – a reminder that the system that had sustained Mugabe for so long remained intact, despite his removal. For those who don’t watch Zimbabwe closely, Emmerson Mnangagwa appeared to be a new, fresh and unknown figure. But Mnangagwa – or the ‘Crocodile’ (Ngwena) – has been at the heart of ZANU-PF and Zimbabwe’s politics for more than four decades. Mnangagwa is one of just two politicians who have served in every cabinet under Mugabe since 1980. Billed as Mugabe’s most likely successor in 2014 when he was appointed republican vice president, he and his allies had increasingly come under attack in 2017 from Women’s League President and First Lady Grace Mugabe as well as the ‘young Turks’ in the faction who supported her. Despite the public attacks against him, Mnangagwa has spent the last two years positioning himself as a pragmatist and negotiator who would help to resolve the political and economic crisis wrought by the Mugabe administration. He had been reaching out to the farmers dispossessed in the early 2000s, to foreign diplomats in Harare who had been eager to see meaningful re-engagement with ZANU-PF and the opposition whose fortunes had declined markedly since 2009. This was partly the reason for his ouster, when leaked Central Intelligence Organisation (CIO) documents reported on by Reuters suggested that Mnangagwa was planning a post-Mugabe future which would involve a 5-year transitional government with the opposition, and the backing of Western diplomats. Three days after his inauguration, Mnangagwa formally dissolved Cabinet and announced that he was returning his key ally, former Finance Minister Patrick Chinamasa to his previous position to allow for continuity. Several key members of Mugabe’s last cabinet are facing charges, and their families have been subjected to significant abuse, harassment and intimidation by the security forces following the takeover. The former finance minister was also beaten so badly during his detention by the military that he had to be hospitalised. Despite Mnangagwa’s inaugural statement regarding a ‘return to democracy’ in Zimbabwe, many Zimbabweans are (understandably) sceptical. Analysts Tinashe Chimedza and Tamuka Chirimambowa refer to the new president as the ‘Trojan horse’ of the ‘deep state,’ which was desperate to ensure its political and economic survival. And despite the apparent lack of bloodshed of the ‘soft coup,’ it is clear that the involvement of the military in politics (and their choosing of an amenable successor) may set a concerning precedent. If reports from inside the political negotiations are correct, it appears that Mnangagwa is still considering an ‘inclusive’ government which includes prominent members of the opposition – who had been caught completely unaware by the rejigging of the political playing field. It appears that he would like to use an inclusive arrangement to consolidate international goodwill, and possibly to postpone the elections scheduled for mid-2018. This is a risky prospect for the opposition, as suggested by Brian Raftopoulos; such an arrangement is likely to be a poisoned chalice for the weakened opposition who will almost certainly be given a marginal and negligible role. International political goodwill also already seems to be at a decade-long high, with the arrival of the first British Minister to the country in twenty years – though the content of the engagement was hardly a resounding endorsement. Less than a week after Mnangagwa’s inauguration, a Chinese envoy had also arrived in Harare and extended an official invitation from President Xi to the new head of state. Such events – along with frequent displays of public goodwill – may lead instead to a decision by Mnangagwa to renege on the negotiations for a more inclusive Cabinet. The four years since Mugabe’s last electoral victory in 2013 have seen a collapse of living standards in the country. Zimbabwe’s economy is now half the size it was in 2000, with 95% of citizens no longer formally employed and a national budget of just $4 billion USD – of which 97% was spent on public sector salaries in 2016. The health and education systems are barely functional and propped up by donor interventions while the substitute currency has seen hyper-inflation soar at over 300% for 2017, despite the dollarization of the economy in 2009. Reports suggest that political insiders had been raiding the economy of hard currency while military elites monopolised the income from the country’s diamond reserves. On 28 November, Mnangagwa announced that he would be combining ministries and streamlining staff in an attempt to speed up decision-making, cut costs and increase productivity. He also plans to quickly revise the country’s indigenisation laws which legislate that all businesses must cede a 51% stake to a Zimbabwean partner. Suddenly – and for the first time in months – there are more dollars available in ATM’s, and reports suggest that black market premiums on notes have dropped from 85% to just 25%. Although Mnangagwa clearly plans to repair the ailing economy, the likelihood of full liberalisation is low, given the high levels of military involvement – particularly in lucrative sectors such as diamond mining. Meanwhile, Ignatius Chombo – the finance minister at the point of Mugabe’s removal – has been charged with defrauding the central bank. These charges allegedly relate to corruption perpetrated two decades ago while serving as minister of local government, suggesting that the ‘new’ government will be loath to prosecute for more recent crimes in which current members of the administration might be implicated. Having instituted a three-month amnesty period for externalised ill-gotten funds and threatened to prosecute thereafter, it remains to be seen how tough the new administration will be on corruption. The high levels of complicity across the political and military elite suggest that this is unlikely. It appears that Mnangagwa is already reaching out to former dispossessed Zimbabwean farmers to help re-boot the agricultural economy – along with his flagship ‘Command Agriculture’ project. Looking forward, the most likely outcome for Zimbabwe’s future is that we will probably see the emergence of something approaching a ‘developmental’ authoritarian state – in which levels of repression remain significant and citizen’s political and civic rights continue to be constrained, but the economy begins to grow again and people’s material prospects improve markedly. Having billed himself as a technocrat and pragmatist, Mnangagwa appears to have wagered that he can normalise relations with Western donor states to improve the economy and that – after decades of downward revision of democratic prospects in Zimbabwe and shifting donor goalposts – the international community would be satisfied by a veneer of democratic legitimacy coupled with significant economic growth and improved trade relations. However – in a stark break from the experience of his predecessor – Mnangagwa will only have two presidential terms in which to do so, following the introduction of a new constitution in 2013. Amidst reports that Western diplomats had long been backing Mnangagwa’s push for the presidency, it is imperative that his administration is treated warmly, but with a healthy dose of scepticism, and that significant levels of aid disbursement are linked to meaningful democratic reforms. Equally, while they still have some leverage, opposition actors must also negotiate for an even playing field and the repeal of the most repressive legislation that had served the ZANU-state project for so long. If they fail to capitalise on it, this opportunity won’t come around again soon. This piece first appeared on the presidential power website. Next articleIs South Sudan Doomed to Fail?